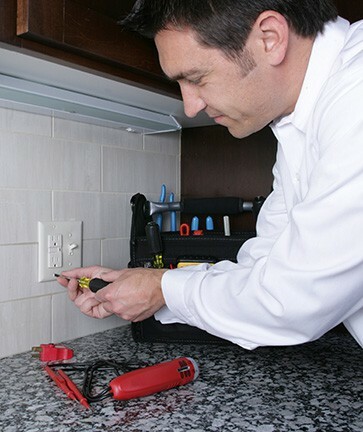 Applewood is proud to employ some of the most highly trained, professional, and state licensed electrical technicians in Denver, CO and the surrounding metro area. When you hire us to enter your home and fix whatever problem you’re facing, we guarantee that your family will be treated with respect from start to finish. Please view our Code of Ethics to get a closer look at our dedication to customer services. A GFCI outlet is an electrical outlet that is specially designed to protect against the risk of potentially deadly electric shock.How do they keep you safe? GFCI outlets use ground fault circuit interrupter technology that monitors the flow of energy through the circuit, turning it off if an imbalance occurs. Having Applewood install them in your home can protect yourself and your family from harm as well as reduce the risk of house fires that can be caused by classic outlets. No matter what you’re looking for, from accent lights to floodlights to security lighting, Applewood is your premier resource for home outdoor lighting electrical services. Our skilled technicians are trained in both installation and repair of outdoor lighting packages and are ready to come by for a consultation anytime.